It’s no secret that the team at Branding & Buzzing loves their beer. Our love of beer extends from local craft to international brews and everything in between. Recently Canada has been seeing a massive cooking with beer trend. Our first cooking with beer recipe came from our friend Matt Dean Pettit of Rocklobster Food. While our team was working on his cookbook, The Great Lobster Cookbook, we discovered Matt’s now famous Lobstah Chowdah. This dish is simple, tasty, and bubbling with beer. Over the last year, we worked on a client project that had us sourcing and creating cooking recipes using beer. The goal was to see just how many recipes we could find with beer in them. There were a lot. This beer-tastic recipe was cooked up by Nads over at Life Over Easy. Her versatile and super easy condiment is sweet and salty. It’s the perfect addition to burgers or sandwiches and a great accompaniment to a roast or cheese tray. “You may just end up slathering it on fresh bread with butter – it’s that good.” Check out her blog post for the full recipe. This beer recipe is courtesy of Alanna at One Tough Cookie. Her beef noodle salad is light enough for the summer weather, but hearty enough to be filling (i.e. not just a salad). It was inspired by the crisp brew she would sip while snacking on street food in Hanoi. To try your hand at this delicious Vietnamese inspired union of beef, beer, and salad, follow along with her recipe here. Jason from Jason’s Bites mixed it up a little by combining the sweet briny flesh of Manila clams with the bitterness of hops, a duo he says perfectly balance each other out. He also throws in a generous handful of basil to accent the herbaceous quality of the lager. 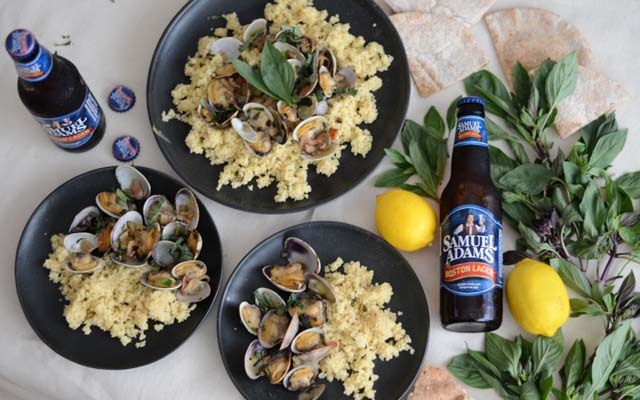 To make your own Couscous Clam Pilaf, check out his blog post. Jennifer over at Seasons & Suppers cooked up this quick, easy and hearty skillet beef and vegetable pot pie, with beer-braised beef, potatoes, carrots and a puff pastry topping. What better addition to a classic comfort food than a crisp hoppy lager? View the full recipe on her blog. Last but certainly not least, dessert! Katrina at Kitchen Trials indulged both our love of beer and insatiable sweet tooth with this delectable dessert. These aren’t just any chocolate cupcakes — she pumped salted caramel and beer sauce into the middle, slathered them in a Swiss merengue buttercream icing, and topped them with chocolate drizzled pretzels. They are the perfect combination of sweet and savoury if you ask us, because everything is better with beer! To whip up some of your own, follow the recipe on her blog.